Sight threatening diseases such as glaucoma, macular degeneration, diabetic retinopathy and others often have no outward signs or symptoms, which is why eye exams including a thorough retinal evaluation, are important to protect vision. Great advances have been made in the treatment of these diseases, making it easier for early diagnosis and treatment. 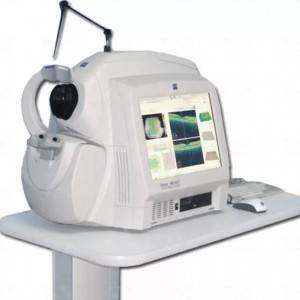 Optical Coherence Tomography (OCT) is a non-invasion imaging test that uses light waves to take cross-section pictures of your retina, the light-sensitive tissue lining the back of the eye. With OCT, each of the retina's distinct layers can be seen, allowing Dr. Jacobs to map and measure their thickness. 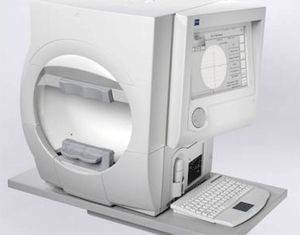 These measurements help with the diagnosis and provide treatment guidance for glaucoma, retinal diseases, and diabetic eye disease. Cataracts & Surgery Co-Management- Learn more about the signs and symptoms of cataracts and treatment options. Glaucoma- A progressive disease which affects the optic nerve and can lead to vision loss. Age-Related Macular Degeneration (ARMD)- The leading cause of severe vision loss in adults over the age of 50. This occurs when there is a central loss of vision. Diabetic Retinopathy- A complication which occurs in people who are diabetic.